How would you like to make freshly baked homemade bread, using just five minutes of your time? I am happy to report that a complete replacement of commercially produced whole-wheat sliced bread with freshly baked homemade bread is entirely feasible. Using a bread machine makes the entire process amazingly simple, consistent, and automatic. 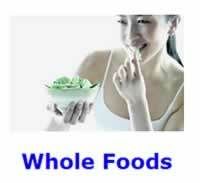 Regularly eating Whole-Grains is part of a healthy whole food diet. The typical bread machine makes a 2 pound half-size bread loaf. It takes me just five minutes to measure out the ingredients and dump them into the bread cooking pot in the above sequence. The bread machine does all the work for you. In the Osler bread machine that I am using, it takes 3 hours and 10 minutes total processing time to produce a homemade loaf of bread. The blade in the bottom of the bread pot spins around and mixes all the ingredients together. It lets the dough rise several times and then kneels it down perfectly. Total baking time is only about one hour. The Health Benefits of Whole Grains are simply amazing. Did you know that according to JAMA eating just two slices of whole-wheat bread a day will give you a health benefit? Contrary to popular belief, eating genuine whole-grains does NOT promote weight gain. Whole-grains are a great way to detox naturally. Science has, also, shown that whole-grains are healthy even for individuals suffering from type 2 diabetes mellitus. The processed whole-wheat bread that you buy in the grocery store contains "Added Gluten." Many, if NOT most, processed baked wheat products, also, contain "Added Gluten." The extra gluten is required by the yeast for the whole-wheat bread to rise better. Using a 1/2 cup of unbleached bread flour avoids having to add extra wheat gluten. With this recipe the bread will rise to a level that is identical in size to a commercial bread slice that fits inside a standard size toaster. 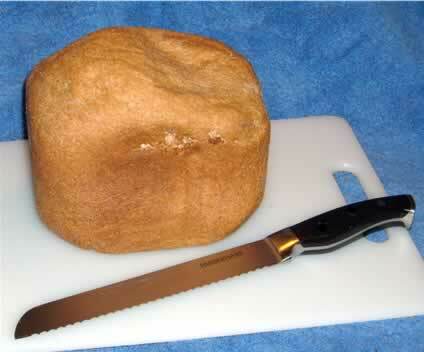 One of the secrets to successful homemade bread baking is using a very good quality bread knife to slice your bread thin. With a little bit of practice you will be able to cut thin bread slices, one at a time. You can cover up the bread loaf with a clean wastebasket size trash can bag that is cut to size. I like to use a clothespin to tie the open end shut. Store your sealed bread loaf inside a bread box, rather than in your refrigerator. The net result is that you will no longer be a victim of having to pay $3.00+ for a loaf of NOT so healthy bread from the store. You will, also, know exactly what is in your bread from now on. Nor, will you be eating any added high-fructose corn syrup or gluten. 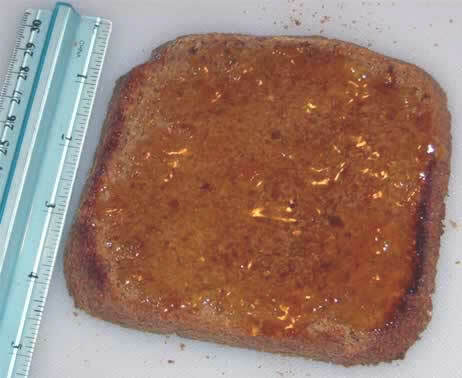 The slice size of your home baked bread will be almost identical with commercially sold bread. Further, you can cut your bread slices as thin or thick as you like.